Ever since we were kids, we’ve gotten scorecards. Every year teachers give us an “A,” “B” or—heaven forbid—a “C” on the quality of our work. When we move on to college prep, we take tests such as the SAT or ACT. Again, the end result is a scorecard. In the content arena, scorecards provide a way for us to assess how our content stacks up against certain criteria. For example, how closely aligned is our content to the style guide? How well does content follow the rules of governance? And how precise are our translations? 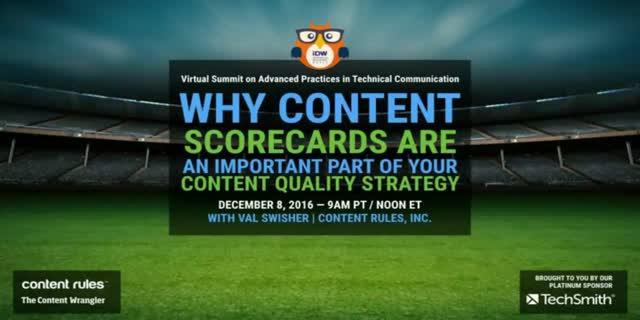 Join Scott Abel, The Content Wrangler, and his special guest Val Swisher, CEO of Content Rules, as they talk about why content scorecards are necessary. Val will demonstrate how to use these scores to make crucial business decisions. Val Swisher, Founder and CEO of Content Rules, Inc. Presented by: Val Swisher, Founder and CEO of Content Rules, Inc.